In honoring local black achievers during Black History Month Dr. John A. Kenney would rank high on anybody’s list. He founded Newark’s and New Jersey’s first all-black hospital in what is now the Central Ward for treatment and care in the community, where African-Americans could intern and then serve as physicians. Until that time, blacks were not found on the staffs of any Newark hospital. Kenney was born in Albemarle County, VA, the son of a former slave. He was educated at Hampton Institute where he was valedictorian in 1897. He earned his medical degree from Shaw University in Raleigh and interned at Howard University. In 1902, Kenney went to Tuskegee Institute where he was a close associate, physician, and friend to both Booker T. Washington and George Washington Carver. 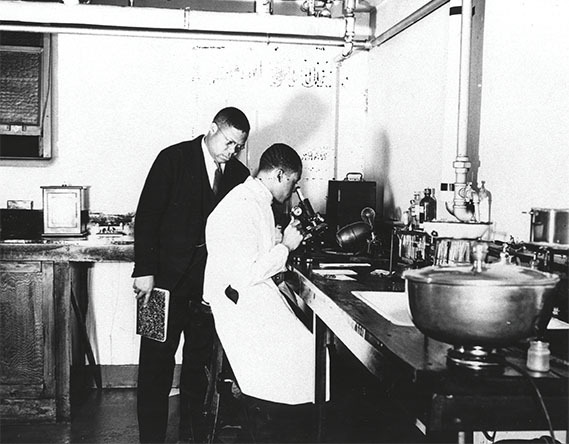 In 1912, at Tuskegee, he founded the John A. Andrews Clinic where blacks and whites worked together serving rural Negroes from communities within a 200-mile radius of the famous Alabama institute. In 1924, Kenney moved north to Newark after an incident with the Ku Klux Klan and founded Kenney Institute or Hospital, named for his parents. Ten years later, on Christmas Day 1934, he gave the hospital to the community and eventually returned to Tuskegee to head the Tuskegee Institute Hospital. He continued until 1939 as medical director and chief surgeon at the Newark hospital. Given to the Booker T. Washington Hospital Association, Kenney Hospital was renamed Community Hospital in 1944. Kenney returned to New Jersey and private practice. He established his new home in Montclair. In 1950, he died at the age of 75 after having carved a niche in the annals of New Jersey’s medical history. Today, Newark is divided into five wards. Under the prior commission form of government, the city was divided into 16 smaller districts or wards. The Third Ward generally was referred to as 'The Hill, ' a name that did not always carry pleasant connotations. Originally, High Street (now Dr. Martin Luther King Jr. Boulevard) was old Newark's western boundary. As the city's population began to swell in the 1830s and pushed westward, the open spaces became more and more crowded. By 1920, the neighborhood was considered a problem area, according to municipal and police officials. Its boundaries then were South Orange Avenue on the north, Belmont Avenue on the west, Avon Avenue on the south and High Street on the east. Charlton, Prince, Broome, Barclay, Somerset, Monmouth and Quitman ran north and south and Warren, Cabinet, Academy and Bank intersected them at right angles. Overcrowding, poor housing and health problems combined to oppress black migrants making their way to Newark to work in the war-time industries and to live in the ward's already substandard housing stock. Dr. Clement Alexander Price points out that the poorest newcomers to Newark were 'pushed into the worst part of the locality, physically and morally.' 'Malaria, tuberculosis, factories with their odors and immoral houses' engulfed the city's newest residents, many of whom were totally unprepared for what urban life had in store for them. Life in this environment was described in a novel by Curtis Lucas, titled 'Third Ward Newark' and published by Ziff-Davis in 1946. An African-American native of rural Georgia, Lucas lived briefly in Atlantic City before moving to Newark in 1942. Upon his arrival, Lucas worked in the wartime Federal Shipbuilding and Dry Dock Co. as a sheet metal mechanic. There he got the idea for his book. The novel revolves around Wonnie Brown, a young woman rebelling against injustice and seeking vengeance against a man who had nearly ruined her life. Lucas was not so much interested in running down his hometown or neighborhood as he was in pointing out local exploitation by landlords, politicians, employers and a social system that allowed discrimination against his race. In fact, the author was quick to state that his novel could have taken place in any number of World War II American cities along the East Coast. Perhaps the greatest influence upon the Third Ward was World War II itself. For the first time, large numbers of parents, especially women, left the home and the family to produce goods for the war. Unsupervised children, the availability of more money than ever before and a housing crisis were hallmarks of the era. Exploitation by absentee landlords fostered general unrest. 'Nearly every corner had its gang of loungers of both sexes, particularly where they could stand about and listen to the blare of jukeboxes from nearby taverns . . . The language used by the loafer in casual conversation was triple-A profane.' Pool rooms, or so-called 'political clubs, ' were filled with young men. Stills were producing corn liquor. Pocketbooks were snatched on a regular basis and 'scarcely a night passed without at least one cutting match or shooting—include fatalities.' Worst of all, the city Health Department was keeping an eye on venereal disease statistics. In 1943, when the crackdown came, it was as a result of an Essex County grand jury investigation headed by Prosecutor William A. Wachenfeld and Newark Public Safety Director John B. Keenan, who had been 'requested' by the grand jury to investigate the 'goings on in the ward.' Both law enforcement agencies were backed by the wartime military police. What a surprise it was to find the executives of several large companies among 130 people arrested one right rather than residents of the ward or even the city. At the same time, the city's century-old tenements were growing increasingly unsafe, health conditions were sliding downhill and public facilities suffered from a failure to renovate them. According to the Newark Housing Authority, the old Third Ward was a blighted, 60-block neighborhood of nearly 2,000 structures in desperate need of replacement. At a series of public hearings, the community generally seemed to agree with Louis Danzig, Newark Housing Authority executive director, who concluded that drastic change was essential. The old Third Ward must be rebuilt. A massive urban renewal project ensued. Not all housing decisions were left to the monolithic city housing agency. As Price reminds us, 'As the black ghettos expanded in size and population, many organizations and institutions were formed which were essentially to survive . . . Most of these were started by the immigrants. They catered almost exclusively to blacks and were important symbols of race accomplishment.' That was especially true in the case of Kenney's enterprise, the Community Hospital. In spite of all the problems facing the ward, including political corruption, the area remained vital to the African-American community. Music, dance and vibrant churches formed the backbone of an area soon to be rebuilt. Perhaps no other part of today's Central Ward held so much promise as well as talent to face the future. The institution that developed out of the community for the community was Kenney Institute , later the Community Hospital, located at 132-134 W. Kinney St. in the Central Ward. Housed in a three-story, fireproof brick building, it could accommodate 34 patients. Adjoining the hospital was a 21/2-story frame building with an additional 16 rooms that also served as an administrative center. On Jan. 1, 1935, Kenney donated the place to the Booker T. Washington Community Hospital Association of Newark. Three days later, it was incorporated as a community hospital. For the brief seven years of its existence as a private hospital, its record was impressive. During that time, it served 4,500 patients. More than 1,100 operations were performed, with only 19 deaths. The facility was used by more than 75 physicians, black and white. More than 50,000 physio-therapy treatments were given. During its operation as a private hospital, Kenney was the only hospital for 'colored people' in New Jersey. Recognizing the importance of the hospital building to the African-American community in the city and state, the Newark Preservation and Landmarks Committee has proposed its nomination as a landmark. The committee has engaged preservation specialist Ulana Zakalak to prepare a National Register nomination. The two-story, rectangular building is in the Romanesque style, recognizable by its two-story brick front and arched central entrance. The entrance arch is composed of 'engaged colonnades supporting a spiral-twist arch, ' and the second floor is 'ornamented by triple window groupings.' Although it was constructed as a hospital, the interior of the building, now owned by the New Salem Baptist Church, has been changed little. The second-floor former medical rooms currently are used as Sunday school facilities. While the building originally was intended for medical purposes, it continues today to serve the spiritual needs of the community in which it is located—a building valuable to the heart and soul of the community.